It was 30 minutes to closing. The store was quiet - just the way I like it. Sales associates are usually getting ready to close their tills or tidying up the shelves during this time frame, so I'm not hounded while I shop. I know they're only doing their jobs and bless their hearts, but there is nothing worse than 15 of them all up in my grill the moment I walk into a shop, asking if I am looking for anything in particular. Sorry love, but I just. walked. in. Give me a moment to inhale your weirdness, puh-lease. Yet, when I actually need someone for assistance? Crickets. That's karma for you right there in all its beautiful annoyance. I was looking at the outdoor stuff, enjoying my blackberry mojito iced tea from a very well known coffee house when all of a sudden, I hear this lady singing out loud along with Maroon 5's, 'She Will Be Loved', that was being played over the PA system, "...I know where you hide, blowing your corn...". Uh....come again? "Blowing your corn?" Oh my gosh, kids. I actually choked and tea literally shot out of my nose, onto my white tank top (OF COURSE) and onto the shelf that housed the placemats. I did a double take to see if anyone saw me, cause if they did, I would have had to purchase and walk out with some pretty hideous, mismatched ones. I know. I'm SO AWFUL. Shame on me. I walked out of the aisle as if nothing happened, when the lady rounded the corner. She came over to me, asking if I was okay when she heard me choking and gasping for air with....wait for it....the same bloody drink in hand! At that moment, I realized two things. A. She obviously likes the same drinks as me, so she can't be that bad and B. I need to be friends with her. Like, RIGHT NOW. Funny enough, a whole lotta people get a whole lotta song lyrics mixed up, like The Backstreet Boys, 'I Want It That Way' "...Ain't nothing but a heartache, ain't nothing but a beefsteak...' or Eurythmics, 'Sweet Dreams'. "...Sweet dreams are made of these, who am I to disagree, I travel the world in generic jeans...". My family is famous for these blunders. My sister used to sing, 'Spiderwebs' by No Doubt - "And it's all your fault, I scream my balls off..." instead of 'I screen my phone calls'. No one ever corrected her, we just laughed. My husband thought in the song, 'Independent Women Part 1' from Destiny's Child went, "The shoes on my feet, (I farted), the clothes I'm wearing, (I farted)..." aaaaand "...All the women who are independent, throw you hands at Batman..."
But none is more hilarious than my seven-year-old. Taylor Swift's, '22'. "It feels like a perfect night to dress up like hamsters, make fun of our accents..."
Pink featuring Nate Ruess, 'Just Give Me a Reason'. "Just give me a reason, just a little bit of nuts..."
Eminem featuring Rihanna, 'The Monster'. "I'm friends with the mustard, the sun overhead..."
Lorde's, 'Royals'. "And we'll never be Royals, you can call me green bean...."
She's so hilarious and too fabulous. And speaking of fabulous? THESE. BROWNIES. Seriously you guys. Combining two of my favourite treats into one? There ain't no misunderstanding here. Oh, and PS. Did anyone ever find out what the heck The Backstreet Boys wanted "that way"? *For a gluten-free treat, substitute all-purpose flour for Cup4Cup flour. I've made these brownies quite a few times and these are spectacular with this particular flour. **You can absolutely use quick oats in this recipe, but I prefer the presentation of the rolled oats. To make this gluten-free, be sure to use gluten-free oats. Preheat oven to 325ºF. Line an 8 x 8 square pan with parchment paper, leaving a few inches hanging over the sides; set aside. Using a double broiler method, place a heat safe dish over simmering water. Add in butter, sugar, cocoa powder, and salt. Allow to melt together, stirring occasionally. Once fully incorporated, remove pan from heat, the dish from top, and allow to cool for about 5 minutes. Once cooled, add in vanilla extract and espresso or coffee granules and stir with a wooden spoon. Add in eggs, one at a time, stirring until your arm feels like it's going to fall off. Add in flour and stir until completely incorporated and well blended. Using an offset spatula, scoop batter into prepared pan and spread out evenly with an offset spatula. Place in oven and bake for 25 minutes or until a skewer inserted comes out nice and clean. Remove from oven and place on wire rack to cool completely. In a large saucepan over medium heat, melt butter, sugar, milk, and cocoa powder together. Once melted, bring to a rolling boil for a full minute. Remove from heat and add in vanilla extract, taking care as it will bubble up. Add in peanut butter and stir until melted. Toss in rolled oats and stir until oats are completely covered and everything is well blended. Pour mixture over top cooled brownies. Use an offset spatula to ensure even coverage. Place in refrigerator and allow them to chill for a couple hours. Once chilled (the brownies and hopefully yourself), lift them out and cut using a sharp knife. Note: These cut much better when they are chilled. 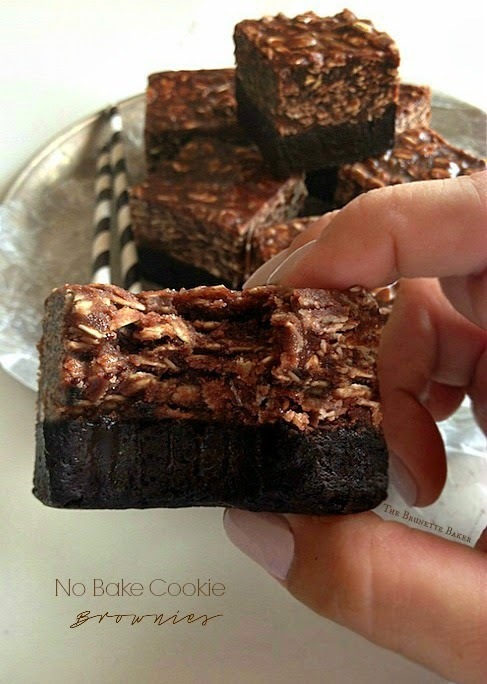 The brownies will squish and the no bake cookies will crumble if they are cut at room temperature. Oh my word -- song lyrics can be so misleading! My niece does the lyric thing all the time and if you correct her, she will fight you tooth and nail that she is right. Especially if Jack White or One Direction are involved. Btw, these look like chocolate heaven...swoon! Confessions of a chocoholic: I'll be thinking about these all day! anyway. THEEEEESE BROWNIES! Obsessed! I love no bakes and I love how chocolatey and dense the brownie base is! pinning! see, this is what i'm saying! NO ONE KNOWS what BSB are talking about in that song!!! So fabulous! Thanks for linking up with What's Cookin' Wednesday! these looked (and I am sure they are) great, but too bad I was looking for a completely no bake cookie. I saw your post on IG and immediately dropped what I was doing to find this recipe. And I am currently drooling wishing I had a batch in front of me. GENIUS! Will be making them for my holiday party!